A large number of rooms have been reserved in two different hotels. In case you are interested in this solution, you must personally contact the preferred hotel at the indicated e-mail address within the respective deadline and finalize your booking mentioning the relevant booking code. The prices below are intended per person per night. Single room 47,50 EUR, Special rate for students: 41,00 EUR. Breakfast included. Double room shared with a course colleague 33,00. Special rate for students: 25,50 EUR. Breakfast included. 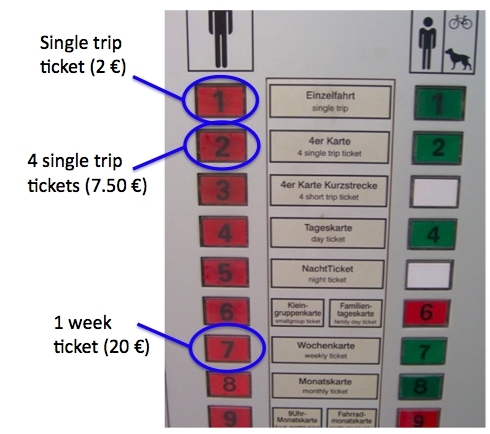 Single ticket (2 €): Valid for 1 hour within the Dresden tariff zone after validation. 4 trip ticket (7.50 € ): Same as the single trip ticket, but can be used for 4 trips, or for up to 4 people doing one trip together. Weekly ticket (20 €): Valid for 7 days after validation (including the day of validation, and till 24:00h on the seventh day ). The full map of Dresden bus and tram lines in pdf . 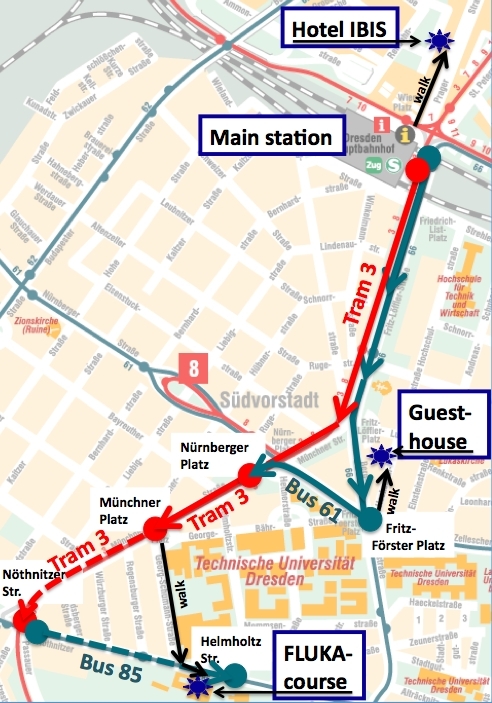 From Dresden main station (Hauptbahnhof) to International Guesthouse: Exit the station to the east and take Bus 66 direction "Coschütz". Exit at the stop "Technische Universität (Fritz-Förster-Platz)". Then find the "Hochschulstraße" and follow it. The guesthouse is at number 50 on the left side. From Dresden main station (Hauptbahnhof) to Hotel IBIS: Exit the station to the nord towards "Wiener Platz", and enter the "Prager Straße". After 500m, you arrive at the IBIS hotels (there are 3 of them in a row). Hotel Lilienstein is the last one. From station Dresden-Neustadt: Take city train S1 direction Bad Schandau or Schöna or tram 3 direction "Coschütz" and get off at Dresden main station (Hauptbahnhof). From there, proceed as described above. After buying a ticket as described above (the airport is still within the Dresden tariff zone), take the tram S2 with direction "Pirna Bahnhof", and exit at "Dresden Hauptbahnhof" (Dresden main station). From there, proceed as indicated above ("Arriving by train"). 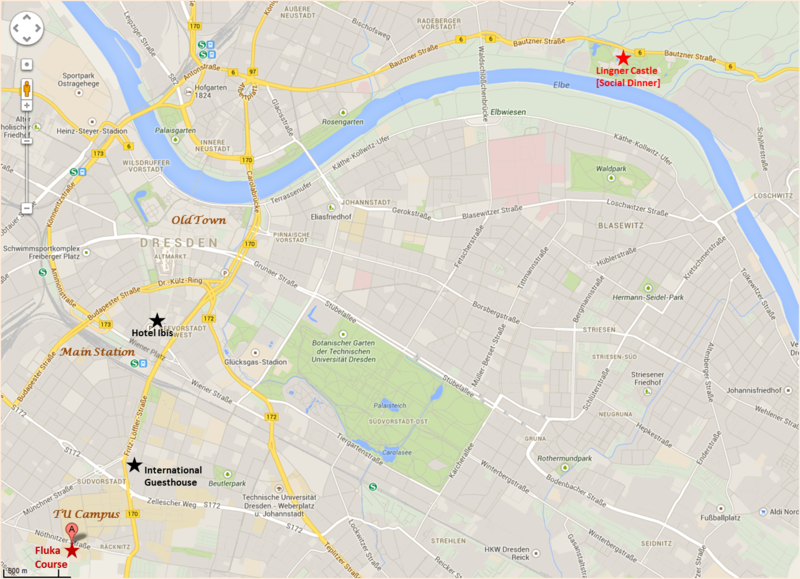 To International Guesthouse: The guesthouse is located at Hochschulstr. 50 in Dresden. Here you find a map from which you can driving directions. To Hotel IBIS: Follow the instructions given here. Program your navigation system to "Reitbahnstraße" (this brings you to the garage of the hotel). 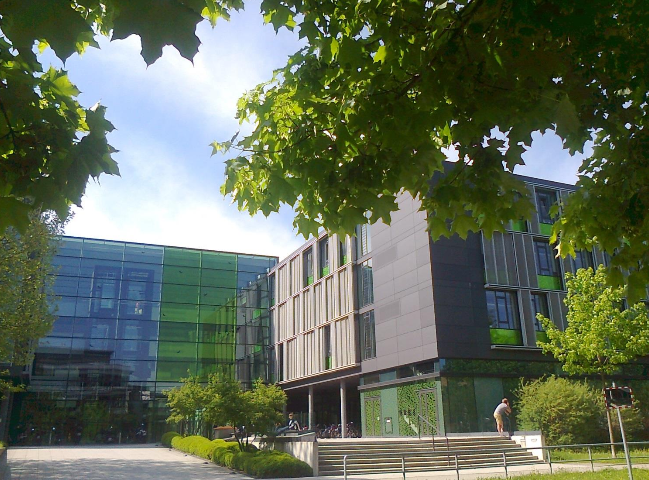 The FLUKA course takes place at the faculty of computer science of the University of Dresden. The address is Nöthnitzer Straße 46. The FLUKA lectures take place in room E069. From Hotel IBIS to FLUKA course location: Go to Dresden main station and take tram no. 3 direction "Coschütz" and get off at the third stop "Münchner Platz". Then walk the "Georg Schumann Straße" up to "Nöthnitzer Straße" and see the computer science building on the opposite side. Alternatively, to minimize walking, continue for one more stop to "Nöthnitzerstraße" and change to bus number 85 into direction of "Striesen". The second bus stop "Helmholtzstraße" is directly in front of the computer science building. From International Guesthouse to FLUKA course location: Walk to "Technische Universität (Fritz-Förster-Platz)". From there, take bus 61 direction "Tharandter Straße" and get off at the next stop "Nürnberger Platz" (it's a 9 minute walk if you don't want to take the bus). Then take tram no. 3 direction "Coschütz" and get off at the next stop "Münchner Platz". Walk the "Georg Schumann Straße" up to "Nöthnitzer Straße" and see the computer science building on the opposite side. Alternatively, to minimize walking, continue for one more stop to "Nöthnitzerstraße" and change to bus number 85 into direction of "Striesen". The second bus stop "Helmholtzstraße" is directly in front of the computer science building.